Any type of system with an acronym can sound intimidating. 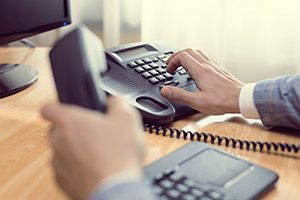 For purposes of this story, we won’t even try to define how VoIP phone systems work over the internet but focus on the dream-come-true functionality of these phone systems for small businesses. Particularly, small businesses who want to look like a big company or at least have the feel of a big company to outside callers. VoIP phone systems offer the functionality of a hotel PBX or switchboard system at prices that make ownership very possible. You are probably thinking a phone is just a phone? That’s probably because until now, it probably was just a phone to you. Now, it can become a highly functional business tool. We will highlight some of those features that appeal to small businesses without getting too technical. To begin with, listening to music on hold is better than sitting in silence but imagine your callers listening to the history of your company, the products you sell and current promotions while on hold. Imagine if you missed a detail in a phone call or want to use a particular phone call for training purposes. Any or all of your calls are recorded for playback later and saved forever. You can even email the entire call to someone. Was there a discrepancy in what was delivered vs. what was discussed? You can review and even send a copy of a phone call to a Smartphone in a message. One of the basic features of a VoIP business system is the ability to have the phone answer itself and present the familiar options of pushing #1 for the Sales Department or #2 for Administration. Every employee can have their own extension and voicemail and even set their extension up to forward to their cell phone after a number of rings or better yet, when people select an employee’s extension, it goes directly to their cell phone that serves as the employee’s extension. Since the call arrived through your VoIP phone system, you can still record the call. Do you need to talk to ten of your employees at once? Conference calling allows that on your own phone system without the need to utilize a third-party conference system and dial-in codes. If a call comes in for an employee and you need a moment to find the employee out in the field to see if he is available for the call, you can “park” the call and the employee can pick the call up in a minute or two from the “parking spot” or you can transfer the call immediately. With VoIp, it’s all about tons of user-designated options. There are other great advantages such as an automatic call logs detailing every call coming in and every call going out. Easily monitor employee productivity and abuse of company time. During a power failure, your phone system stays live because it isn’t based in your neighborhood but in the Cloud. Calls will continue to be answered by the system auto-attendant and routed to the appropriate cell phone so you never miss a call. These are just a few of the robust features offered with economical VoIP phone systems. For more information visit us at www.chosentechgroup.com or call us at 844-283-0100.